This book was written in a clear and easy to understand way, so the layperson can understand the complex processes of the digestive system. I learned quite a lot about how my body communicates its satisfaction (or otherwise) with the foods I put into it. Unfortunately, a lot of my friends were unwilling to discuss bodily functions in a frank and open manner, so I was frustrated by not being able to share the revelations I took from this book. Highly recommended for anyone who wants to be more in tune with their body. 5.0 out of 5 starsAn interesting look at the latest knowledge about our gut. Casually written, easy to read an entertaining while still being very informative and seemingly very well researched. Lots of new ideas that will make me think differently about what I eat and what effect it might have on me, particularly in relation to mood and the link between the gut and the brain. Really well written to make a subject like our innards highly readable, full of good information and written with knowledge and humour. It is easy to read, gives a great insight into the functions of our digestive system and I highly recommend this for everyone who wants to know more about their body or has a gut problem. How could anyone make such a dull subject so interesting? This is how, making it one of the must-read books of the year, or is it decade? I loved this book. I had no idea what a world there is inside our bodies. The gut houses so many bacteria and it's all about them living in peace and sometimes not living peacefully with difficult consequences. I turned the pages down on so many pages. Now I must go back over them. There were dozens of fascinating facts. 5.0 out of 5 starsBrilliant funny quirky and informative. I learned so much great information about the gut. 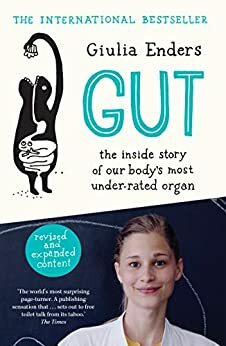 Written for non-sciencey people like myself, it’s given me an insight into a a wonderful world of the gut and all its wisdom and ability. Thank you Giulia Enders and to your sister for the funny illustrations. 4.0 out of 5 starsYoung doctor offers scientific explanations of the workings of our intestines in clear language with humourous illustrations. This tale is told with insights gained from personal experiences and presents evidence from research still in progress. Commitment to this rarely discussed subject is reflected in a host of evidence which is presented in palatable language and with a sense of humour. The workings of our entrails have become a fascinating saga from the laptop of this dedicated doctor.